Located at 1725 Taylor Avenue in Parkville. This information is provided to you to help make your private party an enjoyable experience. If you need further assistance, please feel free to call 410-661-4357, 7-days a week between the hours of 11am – 9pm. Rachel, Tania or Jeanie are here to assist you. 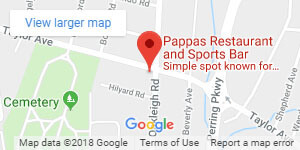 Pappas Parkville can accommodate private parties up to 180, with a minimum of 20. We have three banquet rooms ready to conform to your group’s size. Pappas reserves the right to choose the room based on individual party needs and/or size. All rooms are handicap accessible on our second floor via elevator. *Bands, djs and/or dancing are not permitted. *We do not offer event planning. *We do not offer buffet dining – seated meals only. *We do not book our private rooms after 5pm on any Saturday – no exceptions. Room Fee: This is NOT a deposit. There is a non-refundable room fee of $100. The room fee includes use of linens, set up, clean up and utilities. Room fee is due within 5 days of booking along with your signed contract to confirm reservation. Cake cutting fee: $25.00 includes carryout containers. Guests may bring in an outside cake. Gratuity and Taxes: Add 20% service charge and 6% Maryland state sales tax to the total amount incurred. Please add an additional 9% MD liquor tax to bar options. Additional Staff: There is an automatic $50.00 fee for a bartender on parties of 30 or more. No exceptions. Bar type to be determined two weeks prior to date of event. Deposits: A deposit of 1/3 of the estimated total cost of your final head count is required seven days prior to your event date. This is payable by cash, credit card or check. Any deposit not made will result in forfeit of the reservation. Final payment: Due the day of the affair, is payable by cash, credit card or check. Deposits are nonrefundable, but of course, are subtracted from your final payment. Guarantees: Your final head count, menu selections and details are required ten days prior to the event. Parties not meeting their final count are obliged to pay for the last count turned in. Any event booked less than 10 days out require both non-refundable room fee and deposit to be paid at time of booking with minimum 48 hours notice. The room will start to be set up at least two hours before the scheduled event. If you wish to come in to decorate, please discuss this in advance so a convenient time can be arranged. Flowers and balloons are always welcome, however, we do not allow anything to be taped, tacked or glued to the walls or windows and NO glitter or confetti of any kind. Use of these items will incur additional clean up charges. for your 3 hour event. $27/p plus MD state sales tax and gratuities. Dinner seatings available Sunday – Friday 3pm-8pm, for your 3 hour event. events booked at 8pm. No events booked on Saturday evenings. There is an automatic $50.00 fee for a bartender on parties of 30 or more. or at booking if less than two weeks. A. Cash Bar: Full bar availability: Liquor, Domestic & Imported Beers, House Wines. Guests pay on own per drink. B. Tab Bar: Choose bar tier option (see below). Event host assumes responsibility for full bar tab payment at end of function which will include taxes and gratuity. C. Limited Bar: Choose bar tier option. Event host assumes responsibility for price per person rate depending on tier chosen on contract. Every person over the age of 21 is included in this rate. No exceptions.